The week 21 challenge for the 52 Ancestors in 52 Weeks is Military. I could not believe it when I saw the dates for this challenge. I had already intended to write a post for this week to coincide with the 100-year anniversary of the death of my great-great-uncle Hilton in World War I. What a stroke of luck that the challenge would be Military for this very week. Hilton was born in 21 July 1892 in Bathurst, New South Wales, Australia to Robert Matheson and Edith Ford.1,2 He was the second youngest child of ten children and the youngest son. Sometime after his younger sister Gladys’ (my great-grandma) birth in 1894 but prior to 1903 the family had moved to Margaret Street, Victoria Park, Western Australia.3,4 From all accounts the Matheson’s were a very close family and given the older adult children moved from the east with their family it would attest to this. On 23 May 1918, Hilton was killed instantly by a gas shell in Somme, France, between Maricourt Village and Merrit Wood.5 It is sad that he was a mere six months from making it to the end of the war. It was noted by his comrades that he was buried in an Isolated Grave, Mericourt L’Abbe Sailly-le-Sec Road, 1/2 Mile South South East of mericourt L’Abbe and 3 1/2 miles North East of Corbie.5. I have noted some discrepancy as to whether he was a Private or Sergeant at his death due to differences in various documents. The below quotes are the burial affidavits from his comrades. Hilton is also remembered at the Australian War Memorial, Canberra and in King’s Park, Perth, Western Australia. Do you have any ancestors who served in WWI or WWII? Click the image below to search for them today at Findmypast. I would also love to hear about them – please comment below. 1. Ancestry.com. Australia, Birth Index, 1788-1922 [database on-line]. 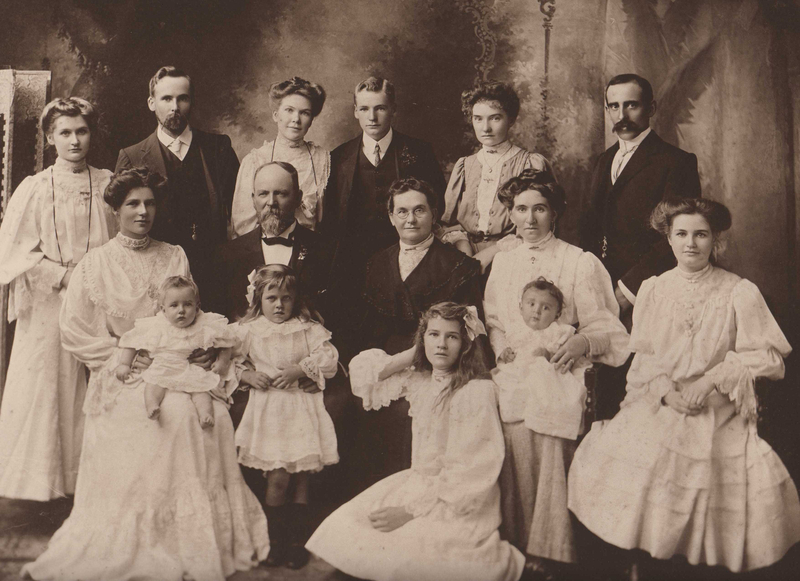 Provo, UT, USA: Ancestry.com Operations, Inc., 2010, Robert H Matheson, 1892 Reg. No. 6475, Bathurst, New South Wales, Australia. 3. 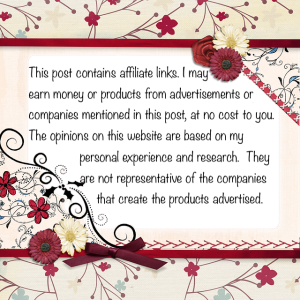 Findmypast, Birth Index Gladys Gwendoline Matheson, 5859/1894, Bathurst, New South Wales Births, Accessed 10 May 2014. 4. Electoral Roll, Robert, Edith, Marion Matheson, 1903 Division: Fremantle, Subdivision: Victoria Park, p.6, Western Australia Electoral Rolls. 5. 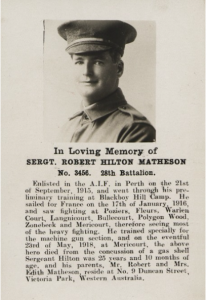 National Archives of Australia, ‘Service Record of Robert Hilton Matheson’, NAA: B2455, Matheson R H, Accessed 2 September 2016. 6. Vincent Library Western Australia, ‘Our Town’, https://library.vincent.wa.gov.au/Profiles/library/Assets/ClientData/Documents/Library/OurTownBook.pdf. 7. 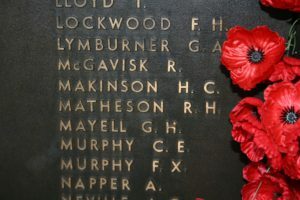 Australia War Memorial, ‘28th Battalion’, https://www.awm.gov.au/collection/U51468, Accessed 8 May 2018. 8. 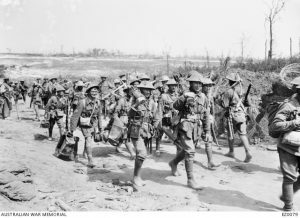 Wikipedia, ‘28th Battalion (Australia)’, https://en.wikipedia.org/wiki/28th_Battalion_(Australia), Accessed 8 May 2018. 9. Australian War Memorial, ‘7th Australian Machine Gun Company’, https://www.awm.gov.au/collection/U51551, Accessed 8 May 2018. 10. 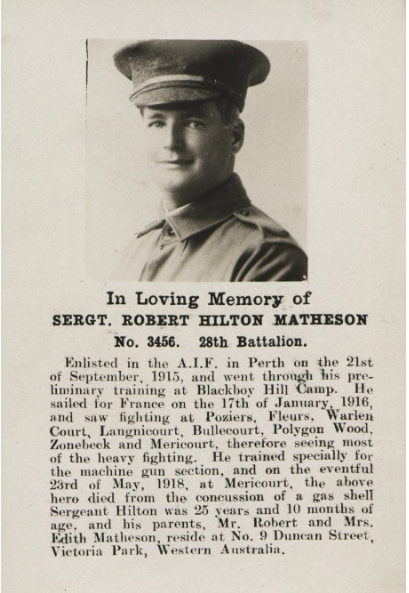 Australian War Memorial, ‘Australian Red Cross Society Wounded and Missing Files, Robert Hilton Matheson, 1DRL/0428, https://s3-ap-southeast-2.amazonaws.com/awm-media/collection/RCDIG1051323/document/5638994.PDF, Accessed 14 April 2015. 11. 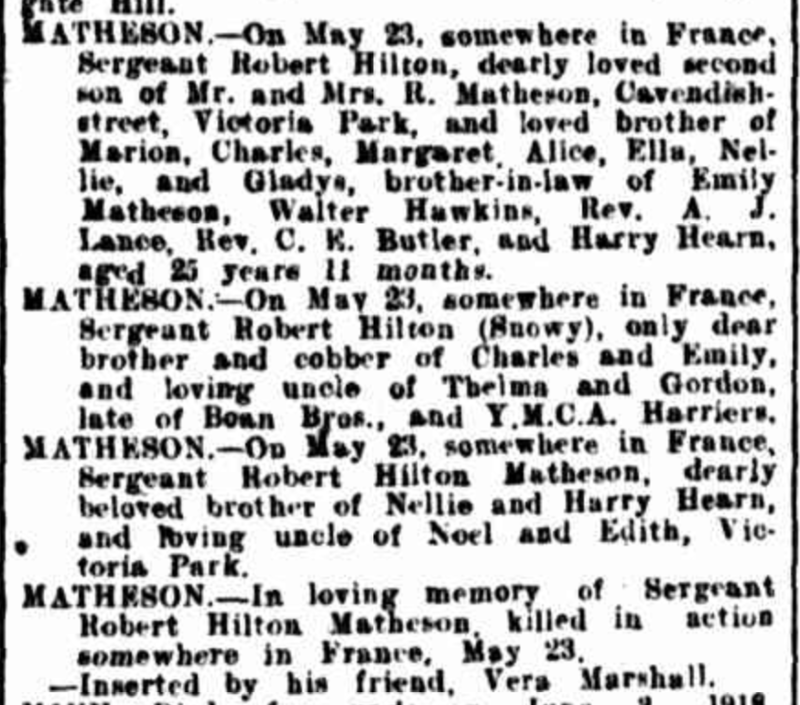 1918 ‘Family Notices’, Western Mail (Perth, WA : 1885 – 1954), 14 June, p. 19. , http://nla.gov.au/nla.news-article37451046, Accessed 14 April 2015. 12. Commonwealth War Graves Commission, ‘Concentration of Graves Burial Return’, https://www.cwgc.org/find-war-dead/casualty/43584/MATHESON,%20ROBERT%20HILTON#&gid=null&pid=1, Accessed 25 February 2018. 13. Commonwealth War Graves Commision, ‘History of the CWGC’, https://www.cwgc.org/about-us/history-of-the-cwgc, Accessed 25 February 2018. 14. Commonwealth War Graves Commission, ‘Grave Registration Report’, https://www.cwgc.org/find-war-dead/casualty/43584/MATHESON,%20ROBERT%20HILTON#&gid=null&pid=1, Accessed 25 February 2018. 15. 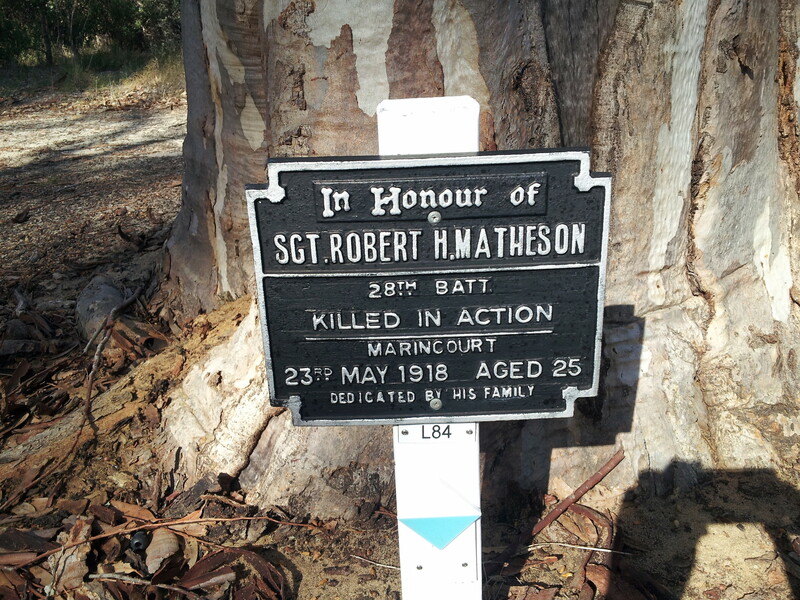 Commonwealth War Graves Commission, ‘Report of Headstone Inscriptions’, https://www.cwgc.org/find-war-dead/casualty/43584/MATHESON,%20ROBERT%20HILTON#&gid=null&pid=1, Accessed 25 February 2018. 16. The Great War, ‘A Guide to British Campaign Medals of WW1’, http://www.greatwar.co.uk/medals/ww1-campaign-medals.htm, Accessed 28 April 2017. 17. Australian War Memorial, ‘1914–1918 Memorial Scroll and plaque’, https://www.awm.gov.au/articles/encyclopedia/memorial_scroll, Accessed 11 May 2018.
a. C.1906 Matheson Family, Perth, Western Australia, Original in author’s possession. 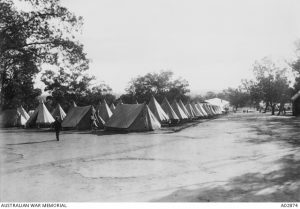 b. Australian War Memorial, ‘Tent lines at Blackboy Hill Camp at Midland Junction’, https://s3-ap-southeast-2.amazonaws.com/awm-media/collection/A02874/screen/6057827.JPG, Accessed 11 May 2018.
c. Australian War Memorial, ‘Australian machine gunners returning from the front line trenches to their billets, in France’, https://www.awm.gov.au/collection/C46382, Accessed 17 May 2018.
d. State Library of Western Australian, ‘In Loving Memory of Sergt. 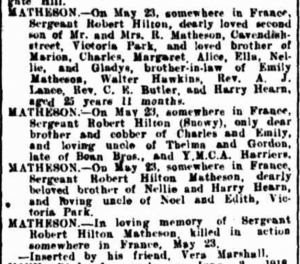 Robert Hilton Matheson, http://purl.slwa.wa.gov.au/slwa_b3108903_1.jpg?agree, Accessed 6 November 2017.
e. 1918 ‘Family Notices’, Western Mail (Perth, WA : 1885 – 1954), 14 June, p. 19. , http://nla.gov.au/nla.news-article37451046, Accessed 14 April 2015.
g. Kings Park, Perth, Western Australia – Photo of Robert H Matheson Memorial, Original in author’s possession. 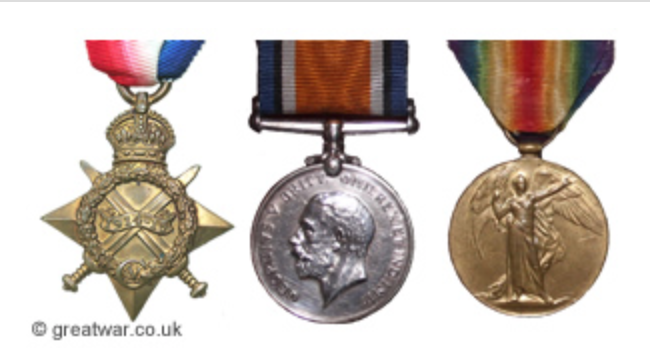 h. The Great War, ‘A Guide to British Campaign Medals of WW1’, http://www.greatwar.co.uk/medals/ww1-campaign-medals.htm, Accessed 28/4/17. I am always amazed at how much detailed information you have about your family members. This is truly amazing about all the information you have about your uncle. I was amazed to find out how his body was exhumed to give him a proper burial….that was truly an honor. Also getting accounts from others who knew your uncle was a great idea to include in this article. I have uncles who were in the war and my father was a serviceman as well. Thank you for sharing so much of your history with us. I am so glad you enjoyed reading about my great-great-uncle. I really wish I had met him as I would love to know more about him as a person. So much history for many families worldwide was lost in the war. I am so thankful though that we know where he is buried, so many others were not so lucky.